Opening "V" of the Book of Jeremiah, Winchester Bible, fol. 148r, ca. 1160–1180. Winchester Cathedral Priory of St, Swithun. 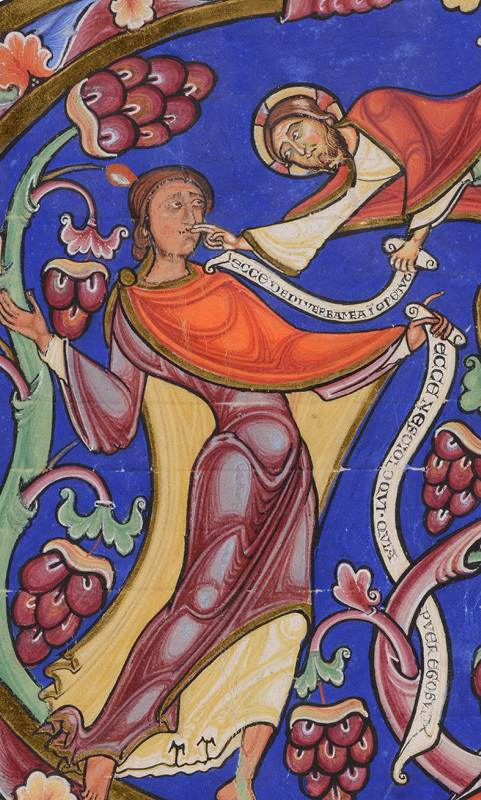 Tempera and gold on parchment. Lent by the Chapter of Winchester Cathedral. Image courtesy of the Chapter of Winchester Cathedral. This exhibition will feature masterfully illuminated pages from two volumes of the magnificent, lavishly ornamented Winchester Bible. Probably commissioned around 1155–60 by the wealthy and powerful Henry of Blois (1129–1171), who was the Bishop of Winchester (and grandson of William the Conqueror and King Stephen’s brother), the manuscript is the Winchester Cathedral’s single greatest surviving treasure. Renovations at the Cathedral provide the opportunity for these pages, which feature the Old Testament, to travel to New York. This presentation marks the first time the work will be shown in the United States. At the Metropolitan Museum, the pages of one bound volume will be turned once each month; three unbound bi-folios with lavish initials from the other volume—which is currently undergoing conservation—will be on view simultaneously for the duration of the exhibition. A highlight of the presentation will be the display of an elaborately illustrated double-sided frontispiece—long separated from the Bible and now in the collection of the Morgan Library & Museum in New York—that features scenes from the life of David and Samuel. Works of art from the Metropolitan Museum’s own collection—medieval sculpture, goldsmith work, ivories, stained glass, and other examples of manuscript illumination—will provide a larger context for the two volumes. The Winchester Bible consists of four bound volumes whose pages measure approximately 23 inches high by 15 inches wide (58 by 39 centimeters). The text of 468 folios was written over a period of thirty years by a single scribe with at least five different gifted painters applying expensive pigments, including lapis lazuli and gold, to calf-skin parchment. Their ambitious work was never completed.